Take Route 15 South to the Route 340 exit and follow sign for Route 180/351. Take the exit ramp for Route 180/351 staying in the right lane. Turn right at the light on to Route 351. Go straight through the next two lights. After the second light, get in the right turning lane. Turn right (at Sandy Spring Bank) on to Mercantile Drive East. Make an immediate right into our parking lot. 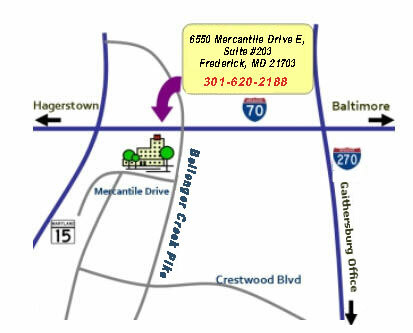 Ballenger Creek Professional Center will be directly in front of you. Enter through the glass double doors. Suite 203 is the second suite on the right. Take Route 70 East to exit 52B Route 15 North. Immediately take Exit 11 for Routes 180/351. At the end of the ramp, turn left on to Ballenger Creek Pike (Route 351). Go straight through the next two lights. After the second, get in the right turning lane. Turn right (at Sandy Spring Bank) on to Mercantile Drive East. Make an immediate right into our parking lot. Ballenger Creek Professional Center will be directly in front of you. Enter through the glass double doors. Suite 203 is the second suite on the right. Take Route 70 West to exit 53B Route 40 West/ Route 15 North. After ?mile exit at the Jefferson Street exit. At the exit light, turn left keeping in the right lane. Exit immediately at the Route 180/351 exit staying in the right lane. Turn right at the light on to Route 351. Go straight through the next two lights. After the second light, get in the right turning lane. Turn right (at Sandy Spring Bank) on to Mercantile Drive East. Make an immediate right into our parking lot. Ballenger Creek Professional Center will be directly in front of you. Enter through the glass double doors. Suite 203 is the second suite on the right. Take Route 270 North to Route 15 North. Take the Jefferson Street exit. At the exit light, turn left keeping in the right lane. Exit immediately at the Route 180/351 exit staying in the right lane. Turn right at the light on to Route 351. Go straight through the next two lights. After the second light, get in the right turning lane. Turn right (at Sandy Spring Bank) on to Mercantile Drive East. Make an immediate right into our parking lot. Ballenger Creek Professional Center will be directly in front of you. Enter through the glass double doors. Suite 203 is the second suite on the right.